Grant Pass is among the greatest places in the American West for whitewater thrills. Forest trails, fly fishing, friendly faces, and a dynamic local arts, culinary and entertainment scene welcome you to this laid-back destination along the Rogue River. Grant Pass boasts one-of-a-kind festivals, theaters, art galleries, hip restaurants, the gateway to the Applegate Valley Wineries, a wide array of antique stores, and a quaint downtown national historic district. Here’s how to spend 3 days and take it all in. 3:00 pm Arrive in Grants Pass. Relax in your room or take a stroll along the river trails right from town or wander the downtown historic district to stretch your legs and scope out your dinner spot for night three. 4:00 pm Board the Hellgate Jetboat “Dinner” Excursion. 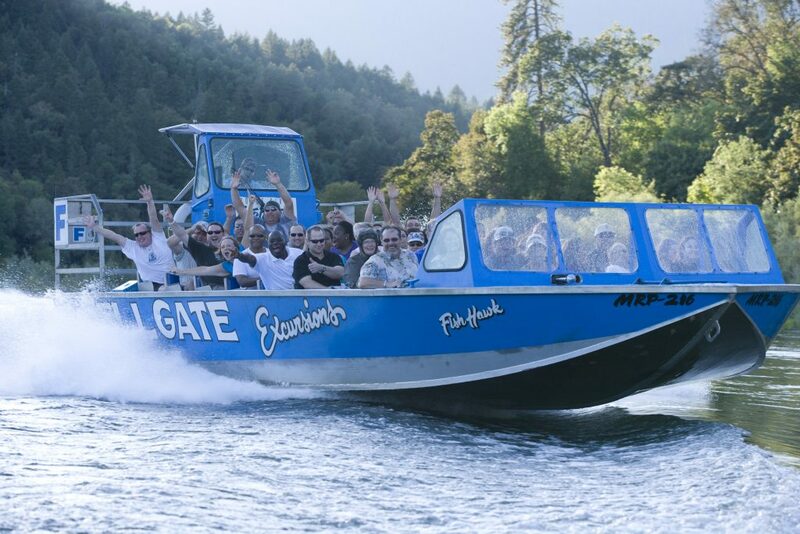 Visitors from all over the world make Hellgate Jetboats their destination for summer fun every season. For over 59 years Hellgate has run trips up and down the Wild & Scenic Rogue River. This allows many who would not otherwise be able to experience the beauty of the Rogue and learn its history. The fully narrated trips are safe for the whole family, making it an easy choice for reunions, business retreats and just plain old family fun. There are five different fun-filled trips to choose form including lunch and dinner packages at the exclusive Ok Corral. 8:00 am - 2:00 pm Jump in the car for a road trip west on Highway 199, the Redwood Highway, to the Oregon Caves National Monument in Cave Junction, 40 miles from Grants Pass. Along the way don't miss the artistic encounter of another kind in Kerby at It's a Burl--a gallery of fine and unusual handcrafted art pieces all made from redwood burls. And also stock up at Taylor's Sausage in Cave Junction on the best jerky you've ever had--Trailbusters Original a Pepper beef jerky. After you take the tour of the famous Oregon Caves you can stop for refreshment at Bridgeview Winery and sample some of Southern Oregon's fabulous wine and relax in the view from the deck. 2:00 - 3:00 pm Relax at hotel. 3:00 - 5:00 pm Tour of Wildlife Images. Wildlife Rehabilitation and Education Center in Merlin was created to provide for the care and treatment of sick, injured and orphaned wildlife. The beautiful facility provides a rare opportunity to see wildlife up-close. 6:00 pm End the day with a cocktail and dinner on the banks of the Rogue River in Galice at Morrison’s Rogue River Lodge before heading back to your hotel for the night. 8:30 - 11:00 am Head to the Applegate Valley, where first stop is Sanctuary One, the nation's first care farm, specializing in care for elderly, sick or injured animals that they take in from shelters, humane societies and law-enforcement agencies. 6:00p.m. Remember scoping out your restaurant in downtown Grants Pass on Day One--tonight you find your favorite place and enjoy the cuisine of your fancy in downtown Grants Pass. Dinner at your choice of restaurants. Upon departing Grants Pass check out the following places along your journey, no matter which way you are driving. There's Crater Lake National Park to the east, the Oregon Shakespeare Festival in Ashland to the south, the Oregon Coast to the west and the truly unsurpassed wine country of the Umpqua Valley to the north. If you are a current partner/member in our programs, or you wish to join our non-profit marketing association, please visit our industry information section.